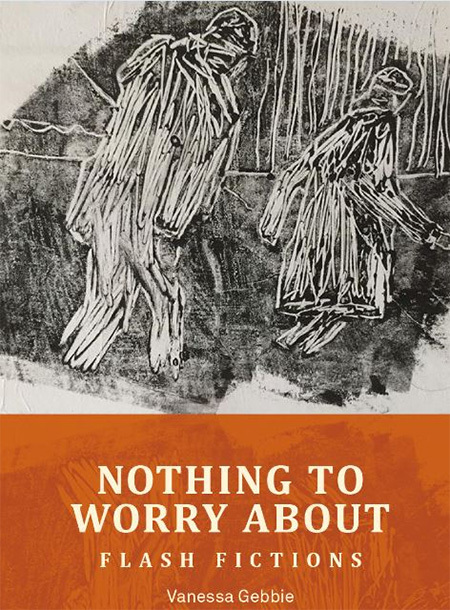 The cover of Vanessa Gebbie’s new story collection, Nothing to Worry About, features a monoprint by Brighton-based artist Michaela Ridgway. In that image two figures seem to move forward with effort and determination. We can’t make out much else about them, but because of their somewhat mysterious and indeterminate outlines, these figures help to create a mood that complements both the stories and the title of this anthology. Everything about this slim volume seems to say there may be nothing to worry about and all may be well if we continue moving forward – or else of course it won’t. In either case we really must keep going. Vanessa Gebbie’s work first appeared in The Café Irreal in 2007 when we published a three-part story called “Three Stages in Learning to Fly,” which can also be found in Nothing to Worry About. This story offers a good example of Gebbie’s tendency to oscillate between a sense of the ominous and a sense that all is well. The piece begins with specific details that immediately undermine our expectations about reality as we know it – Ed’s wife became an ant one night in August after the couple experienced an ant infestation. Ed marks her with a dot of nail polish so he will recognize her later and then takes her outside to the terrace. In a second incident Ed’s wife “became a sound in the grass. Perhaps she was a cricket. She’d always been a little person, self-effacing.” And in the final incident Ed’s wife is a flock of birds which “wheels from roof to tree to roof.” Each part of her flies, but one bird is her heart, and “[a]s the flock crazes, mosaics, wheels, this bird is now at her centre, then her boundary.” Ed is sanguine about these changes, but there’s also a trace of anxiety as he struggles to keep watch over his wife and to keep track of where she ends up after her metamorphoses. So too in “The Note Takers” – also published in The Café Irreal and included in our print anthology, The Irreal Reader: Fiction & Essays from the Cafe Irreal – there is a sense of the ominous, though with perhaps a little less of an implication that there’s nothing to worry about. “You are not looking forward to this,” the story begins. This is because the narrator must tell a waking dream to a note-taker at a scheduled meeting, with the potential for personal harm if the meeting doesn’t go well. The narrator who must communicate this waking dream says, “You must create truth, like glass, out of sand dug from that strange country between sleeping and not.” The situation is dangerous but there is pleasure in it, too – “One can, you have found, enjoy the frisson, the sensation of uncertainty.” Though we never learn why the narrator is forced to speak about dreams to the note-taker in the first place, the situation seems somehow familiar, reminding us of times in our lives when foreboding and anxiety mingle with a desire to get as much from an experience as we can. A third story in this collection which appeared in The Café Irreal, and was also in The Irreal Reader, is “Storm Warning.” A phone call comes from Istanbul at 3:00 a.m., and a woman’s voice can be heard saying, “Storm Warning.” There is also the sound of a “clicking, secretive language, robotic, strange.” This story exemplifies Gebbie’s ability to take a small, strange incident and to build around it an internally cohesive world in which the viewpoint character responds to the incident in subtly unexpected ways that also create a sense of the irreal. This also happens in “Flood,” the fourth and final story in this volume that also appeared in The Café Irreal. At the beginning of the story a drowned man is found. He is claimed by many bereaved people – as the son of one of them, as the father of one woman’s child, as the priest of an abandoned congregation, and others. In all these cases there is the overarching problem that, though these people may be missing a loved one or a significant leader and though the missing man’s dark blue eyes are cited as his identifying characteristic, no one seems to be able to say conclusively that the drowned man is theirs. The inability to say who the drowned man actually is results in uncertainty and anxiety for so many people that we have a sense that reality is being undermined. All of the stories in the volume, in fact, have a sense of unreality (if not irreality) about them and tend to oscillate between the ominous and the optimistic. As the publisher – Flash: the International Short-Short Story Press – says on the page they devote to Nothing to Worry About: “After all, the world keeps turning, and people occasionally do strange things – but then, that’s life, and life is nothing to worry about … Or is it?” Gebbie’s challenging yet engaging short fictions insistently ask us to think about that question and in a variety of imaginative ways. Some of the stories magnify small and seemingly insignificant incidents from everyday life which take us in unexpected directions. In “Gifts” a misdelivered package challenges a whole neighborhood. In “Door” a “lovely door” inspires a lot of activity but never actually delivers what it promises. In “Window” a homeowner decides that privacy is the highest value. In “Swarf” a worker at a nail factory becomes enamored with the shavings that are produced when metal is filed. In each case the story starts with a small aspect of the quotidian and embellishes it, creating a small doorway into an irreal world. In other stories Gebbie deals with larger philosophical and somewhat mystical issues – actually, matters of life and death – yet in a very personal way. In “The Little Archaeologist” Male 6580 has reached the end of life, and in the world in which he lives, a personal archaeologist comes “to plumb you, speak your body away.” This intimate process involves both a physical and a psychological summing up of the individual by a woman whose “slim purposeful fingers calloused at the tip move over, under my skin like so many arthritic spiders.” The story creates a mood of deep sadness in just a few hundred words, yet it manages to assure us that the personal archeologist doesn’t hurt the ones she plumbs. “If a Baby Could Speak,” at the other end of the life spectrum, is the interior monolog of a newborn infant who, besides ruminating about the existence of God, also tells us what it likes and wants in a voice that is surprisingly wise and not what we might expect. And in “Reeds” there are babies growing in the reed beds. The narrator, though warned not to stray off the path or make eye contact with the fetuses, says, “Below me, the water was still as glass. And, under the water, babies. Curled up tight, thumbs in mouths, floating under the surface…” and then feels a strong desire not to heed the advice given. All three stories have a much stronger impact than their brevity might lead us to expect. In “Navigation,” during a time of rising flood waters, people begin to grow sextants and maps and other useful items under their skins. In the title story, “Nothing to Worry About,” a husband worries, despite her doctor’s reassurances, about the fact that his wife is turning to metal. In “Wei-Ch’i” a man comes home to find parts of his wife’s body scattered throughout their home, cool and bloodless, yet he does not seem to regard this as a reason to panic. Though most of the short fictions in this collection are told with relatively serious narrative voices, there is also humor to be found. “Personal Bonsai” takes the form of a letter from a woman whose ear-trees and nostril-trees (as well as trees in other bodily spaces) enjoy classical music and cause their host a variety of problems. And in “Selected Advice for Strangers,” which was first published in Funny Bone: Flashing for Comic Relief, we learn that “It is mandatory to dress as a bee-keeper when visiting the UK for the first time.” The story then proceeds, in perfect bureaucratic jargon, to elaborate on that regulation. Is there anxiety and discomfiture in these humorous pieces? I’m not sure I’d say that, but because these stories unfold in Vanessa Gebbie’s fictional universe, I also wouldn’t be willing to say that there’s nothing to worry about. I write flash fiction too. I will get this.